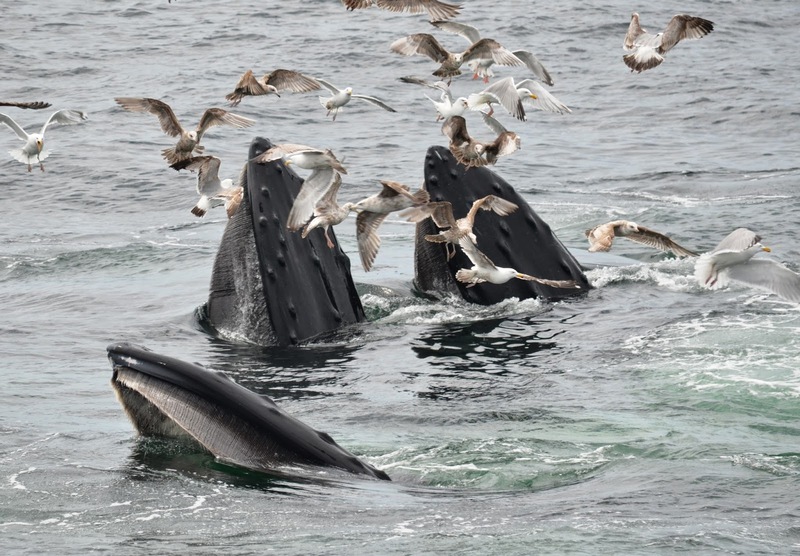 MEDIA RELEASE—Over the past two weeks, visitors on board New England Aquarium whale watches have been probably spoiled for life from enjoying just an average whale watch in the future. 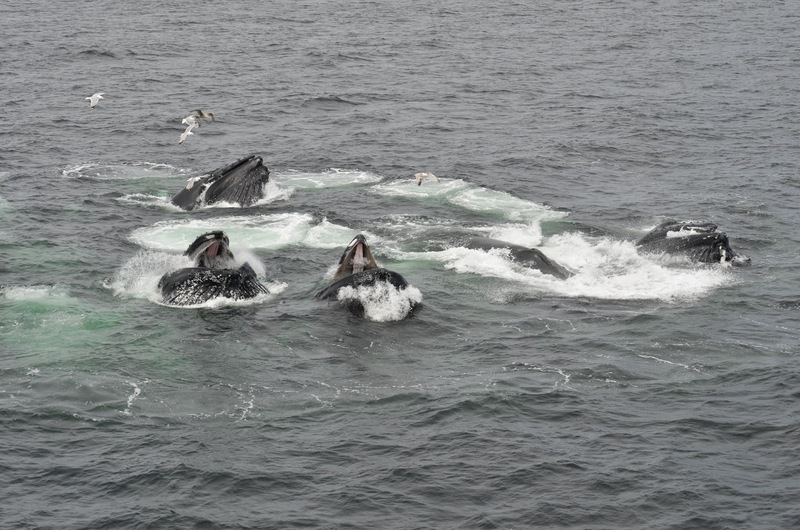 A good whale watch is normally spotting two to three whales fairly close up, but since the beginning of May, these marine wildlife tourists have been seeing six, eight or even a couple of dozen whales in a three hour trip. What is happening to draw so many whales so close to Boston? Well, the feast is on! Laura Howes, Director of Marine Education and Conservation for the Aquarium’s whale watches, which are presented by Boston Harbor Cruises, notes that the object of this whale mania is a slender, 6-10 inch long, eel-like fish called sand lance. These schooling, finger-wide fish, also known locally as sand eels, are like Godiva chocolates to humpback whales. Even though sand lance are found in schools of tens of thousands, they can be elusive to both whales and scientists. To more efficiently hunt sand lance, humpbacks often work together by blowing walls of bubbles around sand lance schools to scare the fish into tighter groups that are easier for the 40 ton acrobats to lunge into and feed on. Dr. David Wiley, Research Coordinator at the Stellwagen Bank National Marine Sanctuary, says that sand lance might be the most important forage fish in the southern Gulf of Maine, but little is known about their life cycle. This week, Wiley is leading a three day research survey for sand lance over 52 sites in Stellwagen, the federally designated whale feeding sanctuary about 25 miles east of Boston and just north of the tip of Cape Cod. Last autumn, a similar survey found almost no sand lance anywhere in the sanctuary. Sand lance populations have long had a reputation of being highly cyclical, but that impression might be more of a reflection of how little is known about the species locally. What is known is that the sandy bottom and relatively shallow waters of Stellwagen are ideal habitat for the burrowing fish that feed voraciously on the bounty of animal plankton in the area. Learning more about the life cycle dynamics will help federal officials better manage this vitally important forage fish that is a foundation species of the oceanic food chain. Tuna, cod, striped bass, haddock, mackerel – all also rely on sand lance as an important food source. Better protecting forage fish stocks like sand lance and herring is good for bigger fish, good for the ecosystem, good for the humpbacks and good for the people who are awed at such an amazing and accessible natural spectacle so close to one of the biggest metropolitan areas in North America.